WE’RE SUPPOSED to watch a new Tagalog movie but it turned out the mall theater we went to has limited its screening hours so we went to see “Searching” instead and it turned out to be a very pleasant surprise. The style used in telling this engaging mystery-thriller by Director Aneesh Chagantry is like the “Unfriended” movies where everything we're told is what we see from a computer, cellphone or TV screens, using various apps, programs and websites. “Unfriended” flicks were produced by the Russian filmmaker Timur Bekmambetov who now also produces “Searching” and the forthcoming “Unfollowed”. The style is similar to the found footage technique used in “The Blair Witch” and “Paranormal Acitivity” series that makes us all electronic voyeurs. The lead character in “Searching” is David Kim (John Cho of the “Harold & Kumar” goofy comedies), an Asian American living in California happily married to Pam (Sara Sohn). They have a daughter, Margot, who’ll be played by different child stars until she becomes a 16-year old high school student being played by Michelle La. In their home videos, we see them in happier times, until Sara gets the big C and eventually passes away. The family’s transition from joy to tragedy is fully documented in their computers. David raises Margot as a single parent and he doesn’t know that she’s drifting slowly away from him as he continues to nag her about bringing out the trash. Then one day, she just disappears and it’s then that David realizes he really doesn’t know his daughter very much. He starts searching for her with the help of their laptop, looking into her e mails, Facebook, Instagram, Tumblr accounts, youtube videos and even her bank account. And he’s shocked to know that Michelle is no longer taking piano lessons for six months when he continues to give her $100 weekly for this. He starts contacting her online friends and this makes the technique a strong storytelling device. He also finds out that she’s communicating with total strangers online in a suspicious site called YouCast. At first, he’s not that worried, thinking she’s just on an overnight camping trip and there’s no signal where she is. But soon, he realizes that she’s seriously missing and informs the police. Soon, a very helpful female cop, Detective Vick (Debra Messing), comes along to help him look for his daughter. Vick says Michelle probably ran away. But there’s a hint that she might be abducted. Is she still alive? Of course, we cannot give anything away. Suffice it to say that the story is very well developed to generate suspense and in getting a gripping emotional response from the viewer as David continues to unravel some of the surprising twists and turns in the plotting. In one instance, we see David installing CCTV cameras to find out the involvement of his own brother, Peter (Joseph Lee), in his daughter’s disappearance. This is the most serious work of John Cho, who also appeared in the last three “Star Trek” reboots. We never thought he could be effective in playing the role of the devastated father who we see slowly losing his composure and breaking down as the mystery deepens in the course of the cleverly constructed film that is also a family drama. You can never guess where the film is going and we’re sure not everyone would like the way the mystery is resolved. But we did. This is the second film shown in Hollywood starring Asian actors after the hugely successful “Crazy Rich Asians” and it’s quite compelling viewing since you feel you’re watching something that requires audience participation. 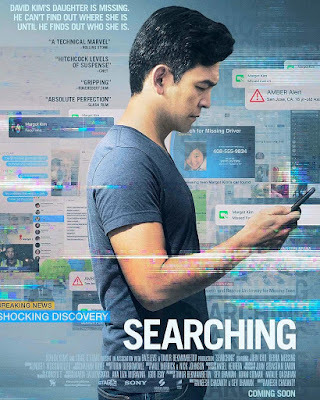 And the searching in the title ultimately refers not only to Michelle’s physical presence but a distraught father’s last minute attempt to make an emotional connection with her. This film really made us realize just how technology has become so much an important part of our lives and we just have to embrace it, for better or worse.